Celebrating with friends and family is one of the greatest joys, but entertaining can be downright terrifying. With this new recipe collection, Daisy Martinez gives you everything you need to make your life easy and your celebrations unforgettable. Daisy offers up timeless and mouthwatering recipes like Ruby Grapefruit Ceviche, Spaghetti with Chipotle-Pork Meatballs, Creamy Chicken-Lime Soup, and Flourless Chocolate-Chile Cake that will prepare you for everything from a cozy festive fall dinner to an elegant New Year’s Eve celebration. Brilliant color, bold flavors, and an innovative mix of traditional and modern cuisines are the hallmarks of Daisy’s cooking. Can’t-fail dishes—like Coconut and Winter Squash Soup—that Daisy learned to cook alongside her mother and grandmother in Puerto Rico mingle with recipes she’s used to entertain her family and friends through the years. With the preparation schedules and time-saving tips included in each menu, Daisy makes it easy to relax and enjoy creating memories with those you love. Martinez serves up a jazzy tie-in to her new public television cooking show of the same name, and while the subtitle’s claim that the recipes within will “rock your world” is pure hyperbole, Martinez does offer a decent introduction to Latin “soul food.” The overly chirpy tone can feel cloying, yet Martinez succeeds in demystifying staples of Latin cooking. Starting with important such basics as Sofrito (a blend of onions, peppers, tomatoes and herbs that adds “zing” to dishes), Achiote Oil (which also adds a “quick kick”) and Recaito (a Sofrito-like seasoning, sans the color and extra liquid), she moves on to tapas, soups, meats, vegetables, starches and desserts. Recipes for the truly cooking-impaired (e.g., Guacamole, Black Beans, Basic White Rice) are unnecessary, but exotic dishes like Breadfruit Tostones (twice-fried crispy chips), Sole Baked in a Banana Leaf, and Stuffed Flank Steak are welcome. Health-conscious readers, beware: this cuisine is laden with animal products, carbs and things fried and refried, and Martinez admits to leaning toward too-large portions, which she calls “Daisy Servings.” Still, anyone new to Latin classics like Paella, Ropa Vieja, and Dulce de Leche should find plenty of motivation within these colorful pages. Julia Child introduced us to French cooking. Lidia Bastianich introduced us to Italian cooking. 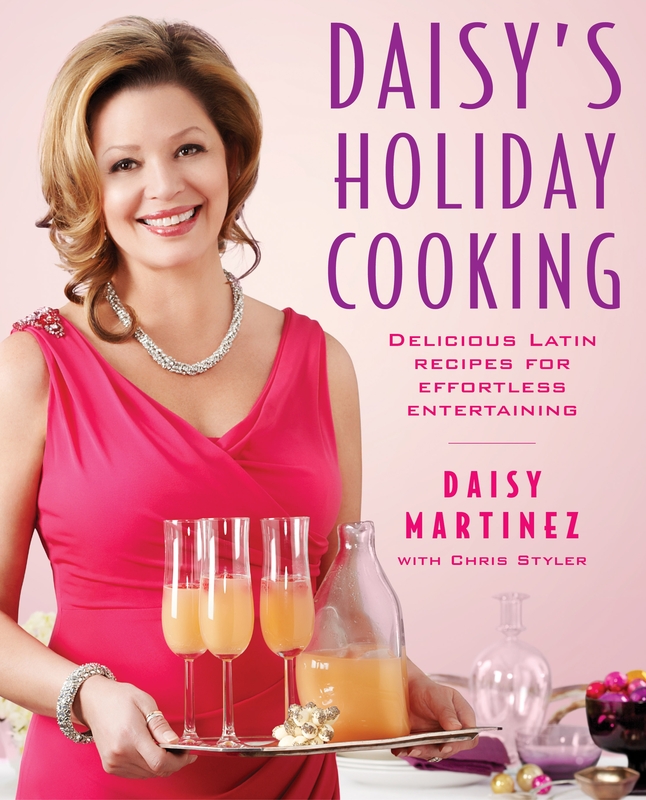 Now Daisy Martinez will introduce all of America to Latin cookingher way. In a country where salsa now outsells ketchup, Daisy Martinez is out on a mission to change the way we cook. 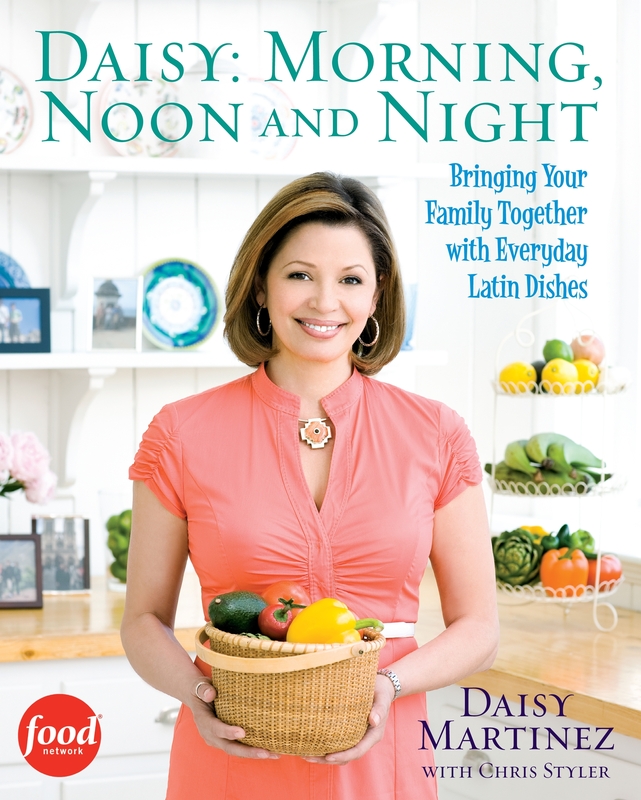 In her new cookbook, a tie-in to her public television show, Daisy introduces us to the mouthwatering meals of her Latin ancestryand not just to the pork, beans, rice, and burritos many people associate with Latino culture. Here are Stuffed Yucca Fritters, Peruvian Minestrone, and Braised Chicken with Figs, to name just a few. By combining the delicious flavor of Latino cultures with ingredients available in any kitchen, Daisy shows us how to daisy-fy regular meals and turn them into something extraordinary. Divided into twelve chapters such as Turnovers and Tamales, Appetizers and Little Bites, Soups and One-Bowl Meals, and Chicken, Duck, and Turkey, and filled with more than 200 recipes and color photographs throughout, this is a cookbook that will introduce a new culinary star. Special features in the book include: Daisy’s Top Ten: palate-rocking staple dishes and condiments that will expand your repertoire, Daisy’s Corner: a series of essays about the intersection of food, family, and culture. I met you in Philadelphia for the Cook and Book Show and the food was delicioso. I love your book and was wondering when will you be coming out with another book??? Daisy is currently gathering recipes for her next book project…we’ll keep you posted! Gracias por su apollo! I am so grateful for your continued support. I have changed production companies and will be back in studio shortly. Hang in there! We will be back, better than ever! p.s. do you think maybe you could track down my book ? Kim: Migui will send you an email on this matter…Thanks for your patience. I hear your a Staten Island girl…. I’m a southeast Annadale guy my whole life…. I started ( as a junior at Tottenville HS ) at Carmens restaurant in 1979….. I can’t tell you how much I love your cooking. I can say your cooking because when I use your recipes, it is just like I’ve eaten at la casa de Daisy! You make cooking look so easy, you have so much enthuasiam, and, like me, you “fam” is in the center of your life. I feel like an honorary Latina! My family loves your food too. Now, if I just make hamburgers, my kids ask “Is this from Daisy’s book?”. When (not if) you write your next book, please include a recipe for mofongo and could you please explain the differences in sausages? I am never sure which sausage to buy. There are so many types – chorizo, columbiano, salami, etc. Good Luck and much continued success. Hola Alex! Greetings from Brooklyn NY! I LOVE YOUR SHOW, ITS VERY INTERESTING OF HOW AN HISPANIC WOMAN CAN EXPLAIN, THE DETAILS OF HISPANICS FOODS AMD DINNER PLATES..I LOVE THE WAY, YOU SHOW SO MUCH COMPASSION AND DESIRE TO SHOW THE WORLD. HOW TASTEFUL THE LATINO/HISPANIC FOOD REALLY IS.. WE HAVE ONE OF HTE MOST EXOTIC DISHES IN THE WORLD. THANK YOU! DAISY. FOR COMING OUT OF THE SHELL AND BRING OUT THE LOVE OF DIFFERENCE FOODS..
Gracias Mari for all you support. I had the opportunity to meet you at Menlo Park Mall. Thank you so much for the wonderful recipes from your book. I also want to Thank You and your assistant for your time, patience, and the wonderful pictures. I was so grateful that you were able to sign my book. My book is now proudly displayed in my kitchen. I look forward to seeing you on TV soon. I did send the Food Network an e-mail making my request to see you cooking on that network. Again Thanks for making my week/end. Your enthusiasm & techniques make cooking FUN! You inspire us to get over our fears, step into the kitchen & be creative! Boricua Cuisine is intense, so I’m thrilled your techniques make it approachable for us young’uns, but also allow the Elders to pick up a few tricks so our Family Gatherings are less laborious, but its still done right! After getting on this website, most of my questions were answered. I feel just like the rest of these fans… Please come back. I already own the book and must say it is great… I just love this website. Can’t wait for her next book. Also, I am so proud ….to have someone like Daisy out there for us… Thanks a million, Daisy. You got talent, beauty, class and intelligence with a lot of passion. No tengo la manera de darle las gracias! Thank you so much for sharing my passion. I have to tell you, I have the best job in the world! It’s really wonderful to receive a post like this, because it validates everything that the whole “Daisy” thing stands for. Wow! What can I possibly say to that, except Thank You so very much! I am very thrilled that you are enjoying the site, and the book. You should know that I have been given a column in Rachael Ray’s magazine “Everyday with Rachael Ray”. The name of the colum in “Mucho Gusto with Daisy Martinez”, so make sure you don’t miss those recipes. How are you I always whatch you show every Saturdays at 10:00am and I love it very much. Stay in touch I love you very much. Happy Holidays. Happy Holidays to you too Yvonne!! I gave your book to my wife awhile ago and she still references it on a regular basis. Any plans for a sequel? Daisy is currently working on a new book and show..keep visiting http://www.daisymartinez.com for updates! Just got married and my husband loves me more! All the dishes I do at our home are Daisy dishes and he loves them. Thank you so much .God Bless you alway. The pasteles and the shrimps are his fav. Catherine, congrats on your recent nuptuals! I’m thriolled you and your hubby are enjoying the recipes…I wish you a million years of happiness together! Congratulations on your “Today” show appearance. I didn’t get to see it but I know you brought the energy as usual. Keep reppin’ Puerto Rico baby. Oh yeah, when are you coming back to Menlo Park? That arroz con gandules you cooked up were bangin! Thanks for the kind words and your continued support! I will let you know when I am headed out towards Menlo Park again, but keep an eye on DaisyMartinez.com to see where I’ll be making live appearances. I love your show! I am so glad that we finally have a boriqua representing! I just had a quick question. Does your book have the tostones with tomatoes jam and crab ceviche recipe? Thanks for your time and help!! Thank you for your kind words,Tanya, you are too sweet! All of the recipes you see on my show are in the book, plus many more. Have fun! We are working hard on getting back to studio, and look forward to updating you on any new developments soon.. Thanks for your good wishes..
I’m a big fan of the show and your food. I ordered the cookbook and really enjoy the DVD that came with it, but I was wondering if there were any plans to release all your “first season” shows on DVD, similar to what America’s Test Kitchen does every year. I think there would be a big demand for them and they’d be a great addition to anyone’s DVD library. There could be a possibility in the near future. Currently I am working on the new show, so it leaves little to no time for anything else!